The Poor People's Campaign is a fascinating thing. Back in sixty-eight, it was to be the great final project of the civil rights movement, uniting all of those left behind by the American economy. It was to be the culmination of Rev. Dr. Martin Luther King Jr.'s work. There's a solid overview that can be found by following this link, which includes some remarkable recordings of Dr. King's vision of the effort. But Dr. King was murdered. And the movement failed. Now, because it's 2018 and reboots are a thing, there's a new Poor People's Campaign. 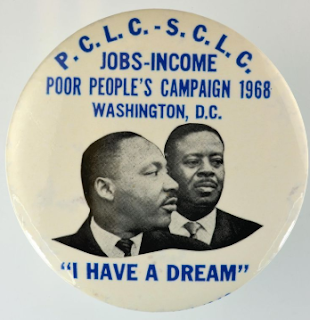 It's well meaning and the intention is what it was in 1968: to bring about justice and challenge racism and deal with poverty once and for all. It's all about Justice, because every movement of the Left is about Justice. Dig deeper, though, and it becomes more diffuse, the usual smorgasbord of causes on the left spectrum. This is useful for building a coalition, admittedly. Here the People are, under the Umbrella of Justice! Only, well, when it comes to doing anything to bend the arc of history, things get a little amorphous. A little pillowy. Take, for pointed example, the very public failure of the Occupy Movement. It had energy. It had the attention and the sympathy of a nation at a time of economic crisis. But other than working out the dynamics of how to live in an increasingly muddy tent city, it couldn't find a common focus to act. It lacked the One Great Aim to be Pursued with Force and Determination, and turned inward, towards managing its diffuse internal political dynamics. There, it devoured its own energy. Which, given "justice" as an organizing principle, is no surprise. Justice is, after all, the equitable balance of competing interests within a culture. It's inherently self-referential, and oriented towards process and internal systems thinking. For that reason, it's a poor ground for progress. It doesn't call a culture to transcend itself, but rather to chase endlessly after the Procrustean ideal of everything coming out even. Justice, writ large, is just too dang large. It's everything, all at once. And "let's do everything all at once" is a great way to ultimately do nothing. Are people "poor?" I mean, sure they are, and the calcification of class is a real thing, but do poor people think of themselves as "poor" in 2018? Perhaps they do. But to my ear, that language seems challenging. Saying "I am poor" is a hard thing. It always has been. It requires admitting that your agency is compromised. It requires acknowledging that socioeconomically, your personhood is diminished. And our culture offers up alternatives now, alternatives that light up our pride of self. That whisper falseness into our hearts about why things are as they are. People are "faking it till they make it," but they're not poor. People are just that one big break away, they just know it, but they're not poor. People are having a hard time right now, but they've planted that seed with Pastor Creflo, and they just know if they try a little harder and pray a little harder, the Lord will bless them with abundance so long as they have a heart for God's abundant blessings. The challenge, for the organizers of this reboot, is that you're pushing against deeply entrenched forms of self-understanding that make it harder and harder for the "masses" to resonate with your message. Even those who might most benefit from it. And the language of the left, stilted and academic and formal? That just isn't how you speak the common tongue. It just won't get the job done. This is not 1968. I realize that's hard for us to grasp, but it isn't. The political dynamics are different. Culture is different. And Christianity is different. The dear sweet oldline denominations that defined Christian identity in 1968 no longer hold the same place in popular culture...or even in Christianity. The new movement may not have gotten that message. Take the activist/pastors who lead the movement. They are front and center in marches, and they're wearing robes and stoles and clerical collars. This...er...isn't exactly representative of mainstream 21st century faith leadership. Fine for royal weddings, sure, but oddly dissonant for a putatively progressive movement. I mean, I like the robe'n'stole look. I do it myself, in church. But it feels...I don't know. There's a peculiar vibe about it. A little stale. A little off. A little Uncle Rico, reliving his dreams of glory. That's always struck me as the challenge, at least in my neck of the woods. We're trying to be who we were, only...well...we're not that any more. And here in 2018, with the reactionary, lumpen-populist right in control of all branches of government, do we really believe that demonstrations will be heard? So much of the success of the civil rights movement was predicated on getting the message out, and connecting with a broad swath of America. In an era when everyone tuned in to ABC, NBC, and CBS for their nightly fix of news, and media was deeply trusted, the civil rights movement had a narrative that soared. It was both clear and interesting. Well-dressed, peaceful black men and women were seen nightly assaulted by profane, abusive racist thugs. It was compelling and clear and...importantly...seen by all. But again, this is not 1968, and the media environment is different. Where once a small group of networks provided the foundation for a unifying national narrative, now media is critically fractured and diffuse. For any contemporary mass movement, this is an immense challenge. Oh, sure, you're #tweeting and getting #retweeted by the sealed media silo of the Usual Suspects. It feels like a thing is happening. But that thing is contained by the self-selected firewalls of new media. You can break out of it with a compelling singular purpose, as with #MeToo or the youth-led campaign against the plague of gun violence. Unless you have a focused long-game strategy to breach the boundaries of your echo chamber, new media's illusion of democratized communication is just that: a phantasm, one that can be used to tamp down your narrative under the smothering chaos of a thousand competing narratives. I'm not sure the movement is beyond that. No-one is more horrified at the venality, self-delusion, and incompetence of our current administration than I. No-one. Seriously. Fight me. And I get that one wants to maintain energy, that one wants to Resist, and that there are real issues there. Unemployment is at record lows. Good paying jobs are out there going unfilled, as an economy superheated by debt-fueled tax cuts turns it up past eleven. It's not that there aren't poor folk. It's not that there aren't issues to be addressed. But starting a "justice economics" mass movement now seems utterly futile, because the masses are flush with the fever-dream of a borrowing bubble. There's just not going to be the necessary energy there, the rumbling volcanic pressure of discontented millions. It was that energy, fueled by a time of significant economic crisis, that lit up the Occupy movement. Occupy caught the attention...and for a moment, the sympathy...of a nation. Occupy squandered that moment, sure. But it could have been a thing. The potential was there. That potential isn't strong now. It's like trying to build a sandcastle when the tide is rolling in. It's just going to come apart. Three, four, five years from now? There's the strong likelihood things will be different. You can't govern this incompetently without doing damage, and that damage will be significant. Mountainous debt, catastrophic neglect of financial and environmental regulation, and the inevitable impacts of climate change? The time will be right. It will. But it just ain't now.